Hassocks and Preston Park on the London to Brighton Line in the Southern Region of British Railways. 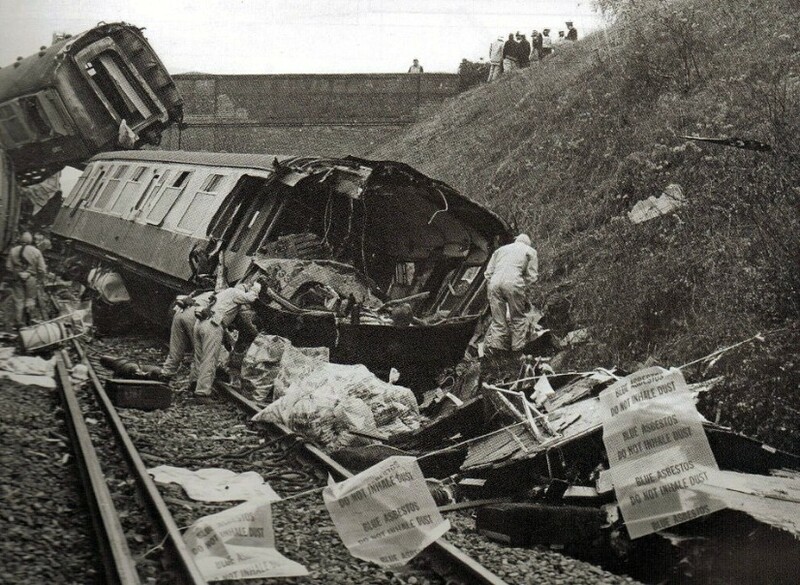 injured and to the efforts of all those concerned with searching and clearing the wreckage and re-opening the line. 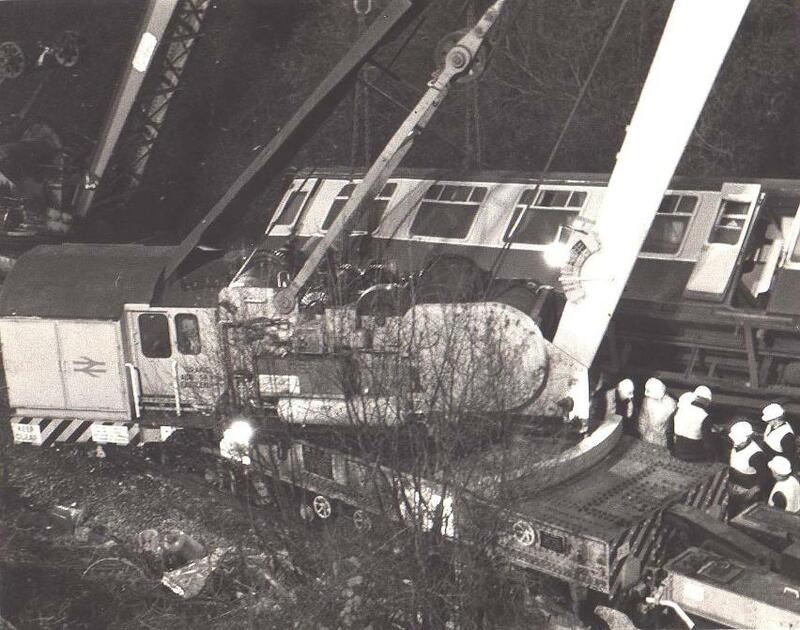 At the time of the accident it was very dark and cold although the weather was generally clear. into the deaths of those killed in the accident. reducing to 80 mile/h between the tunnel and the scene of the accident. 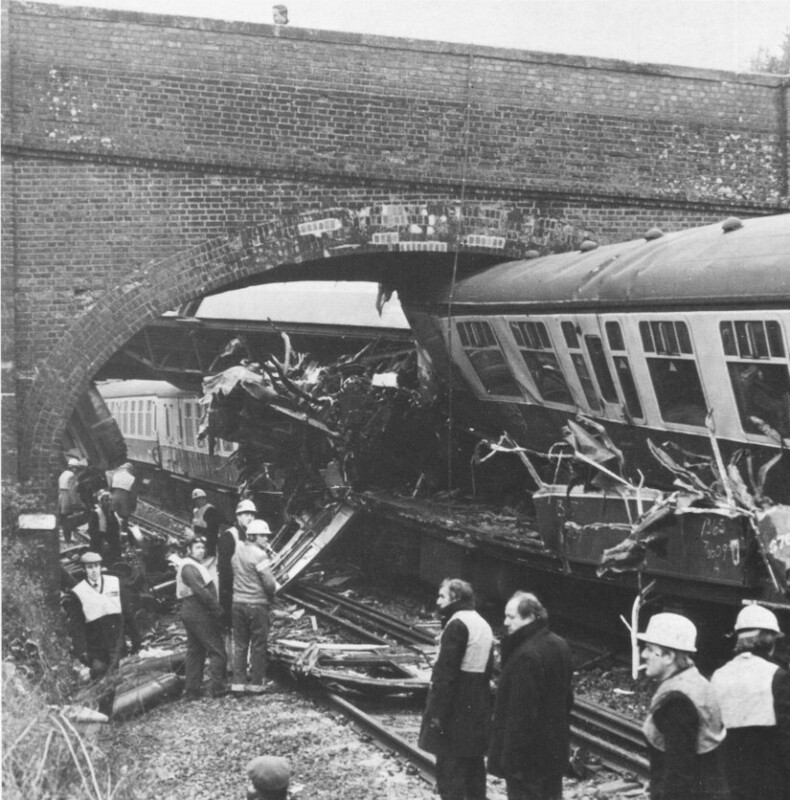 signals was equipped with the British Railways Automatic Warning System. yards. 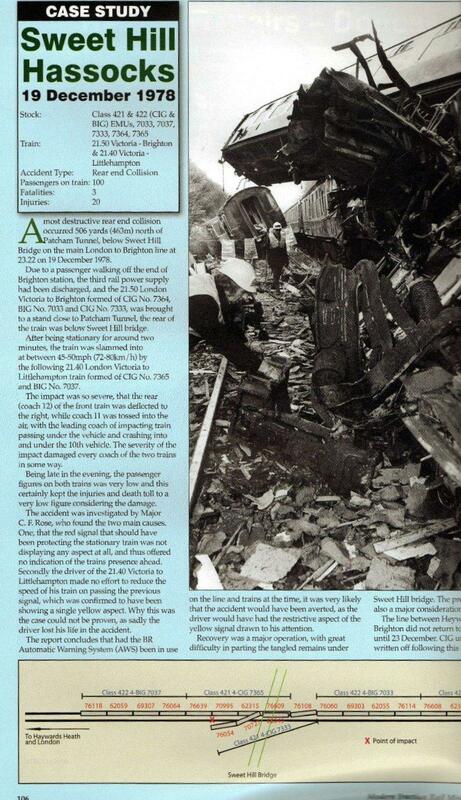 The question of emergency braking distances is discussed in paragraphs 35 and 36.
a Driving Trailer Composite. The overall length of the train was 797 ft and its tare weight 455 tonnes. continuing to Littlehampton and the rear unit forming the 22.29 stopping service from Haywards Heath to Brighton. Westinghouse automatic air brakes. Their maximum service speed was 90 mile/h. When the 12-car Brighton train stopped at Signal CA.4 its driver applied the electro-pneumatic brake and kept it applied. coach was under the tenth coach of the Brighton train, the rear parts of both these coaches being under Sweet Hill Bridge. 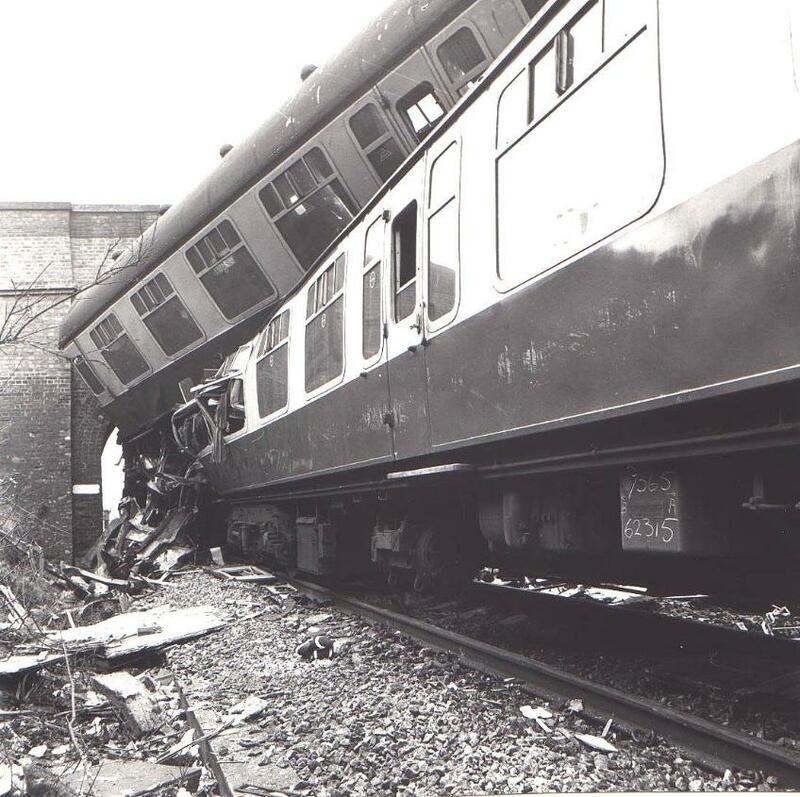 less severe, being confined in the main to shock damage similar to that in the leading 8 coaches of the Brighton train. 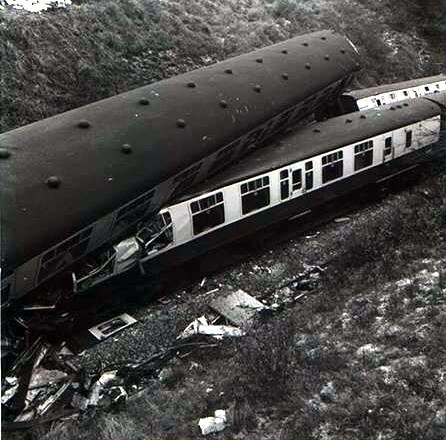 the 21.40 Victoria to Littlehampton service. off. Signalman D. L. Symes received this message and contacted the Electrical Control at Three Bridges at 23.1 1.
accident and asking him to call the emergency services. approach and stop at it. 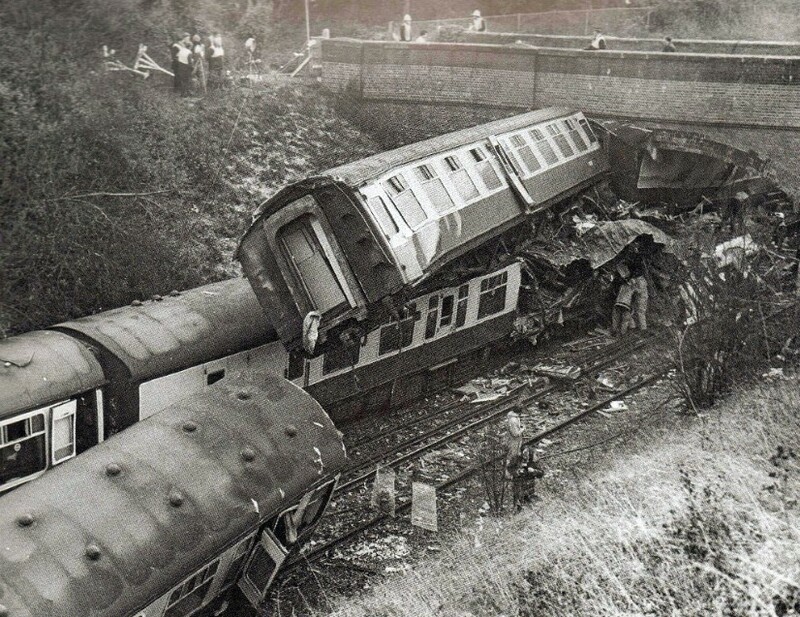 train advising him of the accident was the first and only call he received from Signal CA.4. 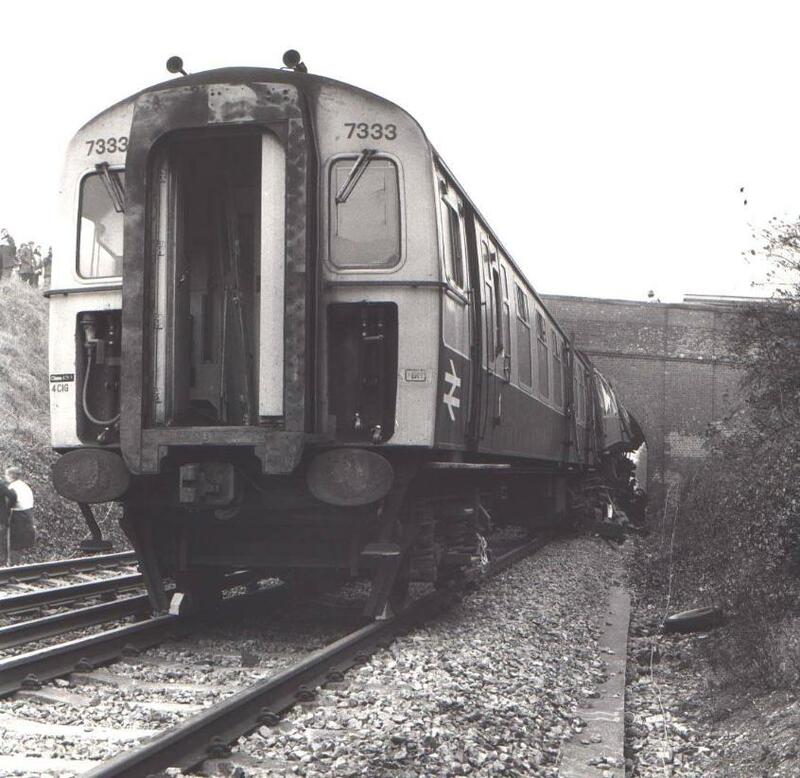 front portion forming the Littlehampton service and the rear portion was already occupied by both the previous trains. normally he would work for months without having to stop a train between Hassocks and Preston Park. 'Obstruction Danger' bell signal from Preston Park and replaced his signals to Danger. rear cab to release the hand brake and at this time the red blind was correctly illuminated. another member of the staff had gone back to protect the obstruction. (CA.4) beyond the bridge displaying a red aspect. collision, he would have noticed it and remembered it. allowed the train to roll slowly forward and stopped about 30 yards from the back of the other train. stopped at Signal CA.1, south of Patcham Tunnel. apparatus case and the signal and found it satisfactory. the aspect sequence of Signal CA.6 and the signals in rear and these were found to be correct. 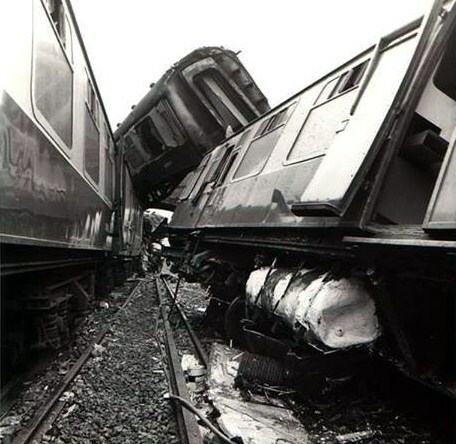 records showed that all lamps had been changed on 26th October 1978, that is just under eight weeks before the accident. Brighton line he had known occasions when high resistance contacts had developed between lamps and lamp holders. he had actually found a high resistance contact; it had been a long time ago. of extraneous metal or material associated with the spring or contact area which might have caused the high resistance. this could well have been sufficient to cause intermittent arcing. Vine found nothing to suggest that the brakes were other than in proper working order at the time of the accident. as a result of the collision; he thought it most probable that the handle was in the off position at the moment of impact. red light. The sighting distance of the red light was measured as 418 yards. coming to a stand without difficulty at Signal CA.6. mile/h at Signal CA4_ and the train stopped with its front end 66 yards beyond this signal. during the night when the traction voltage may have been above 675 volts. The curves are shown in Figure 4 opposite. (AWS). I do not think that the accident would have occurred. treat the absence of a signal (at a place where one is ordinarily shown) as a Danger signal. cab, or outside the train, might have diverted his attention at the critical time. signalmen and others involved in dealing with the previous incident at Brighton Station; they acted properly and sensibly. no way of telling whether the signal is alight or not. to a very low figure indeed. and bring the story up to date. relieves him of his responsibility to observe and obey signals. subconsciously, perhaps even past a signal at Danger. 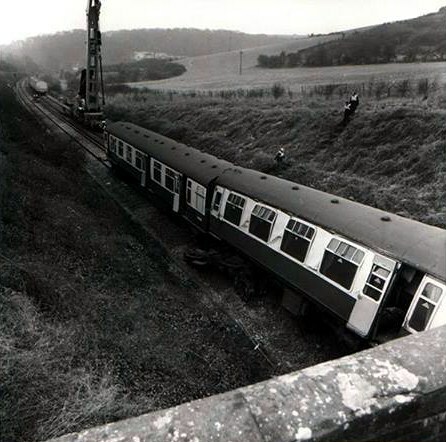 was available, whilst the costs of SR AWS had risen to nearly three times that of the standard British Railways system. when SR AWS was first conceived. signalling, no variation from standard BR AWS could be justified anywhere in Southern Region. provision of AWS will he achieved by 1985. Mr. R.W. Bucton, General Secretary, A.S.L.E.F. but the lamp was out. bro. Mitchell was only marginally involved having stopped at signal CA4. 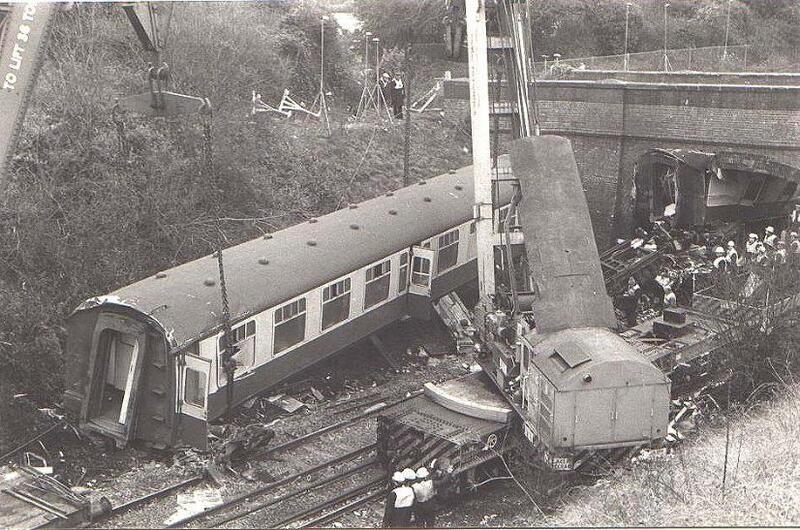 was accepted that signalman Packham was under some pressure immediately after the crash and the leading up to it. that it was virtually impossible to achieve this speed because of voltage restrictions at this point. It is possible to achieve near this but only during hours beyond midnight. factual statement to the inquiry. signal box or the drivers would report a dim signal. signal would have activated the warning system. which led to minute corrosion and this led to this rare failure. travelling slowly and stopped clear of the obstruction. until 1985/6. It will also urge the rapid introduction of the Automatic Warning System. It perhaps will speculate on Bro. between these signals and almost the same again to signal CA4. It will probably mention the fact that no alcohol, natural disease or heart attack contribute to the accident.